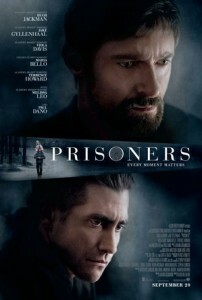 The Hugh Jackman and Jake Gyllenhaal feature, Prisoners, premiered in theaters on September 20. The plot includes Keller Dover who is the father of a young girl (Hugh Jackman) and a parent’s worst nightmare of their child being kidnapped. Along with her young friend being also taken, the families are torn apart as time goes by with no answers, the only evidence being a shabby RV with no clues on where the children could be leaving head of the investigation, Detective Loki (Jake Gyllenhaal) to release the only suspect. But with time running out, this desperate father will do anything to save his baby girl. Throughout the movie, I was very moved by the acting. I understood exactly how a parent would react if put in that situation. What distracted me was the poor transitions from one scene to the next. A character would be in one place, then magically appear to another scene with no explanation, proving to be very distracting to follow the plot. Also while I was enjoying a dramatic scene, it would drag on and fail to reach the point, causing boredom, and distractedness. After the hour and a half passed, I was then wondering when it would end, taking a whole two hours and thirty minutes to reach its point. Although the actors portrayed their parts very well, the plot and transitions totally distracted you from the good of the movie, thus resulting in low reviews. In my opinion, I would wait until it comes out on dvd. 3.25/5 stars.